Today I presented Saulius Gražulis with a Blue Obelisk for his, and his colleagues’ , work on making Crystallography Open for everyone through the Crystallography Open Database (COD). In chemistry and related sciences. This is very much valued and many people and companies use BO software. Because it’s open then don’t have to ask our permission. They don’t have to say thank you (though it’s nice). But they do have to acknowledge author’s moral rights (i.e. acknowledge who wrote the software). In macromolecules there’s an abundance of Open data – the Protein Databank for example. But in “small molecules” or minerals or materials there’s effectively no organized source – apart from the COD. It is hard to build up a voluntary database and keep it running bt that’s what Saulius has done. And much more than that – it is improving rapidly. With the addition of our Crystaleye structures and chemical software the COD is now able to offer a wide range of crystallographic knowledge. You can see PDB close by and Bio2RDF at the bottom. (We’ve talked with Michel Dumontier about how to link to that). So the semantic Web will recognize that if people want semantic crystallography they can come to COD. And we stress that COD data is not only free but can be used for any purpose without permission. You can build programs round it, sell them, derive forcefields, create reference data tables, use it for validation, compute the structures and properties with QM or MM programs, etc. It’s truly OPEN and the largest data set (I think) in the BO collection. We also applaud BO’s NMRShiftDB and will actively work to link this to COD. 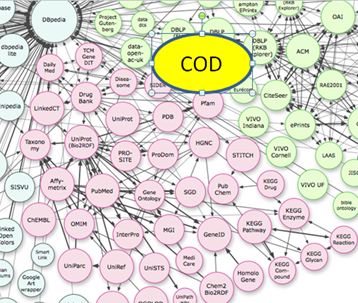 And COD covers all disciplines – organic, organometallic, inorganic – no other database does that. And no other database allows you to link out to other disciplines and link back in. Moreover COD will start exposing molecular structures. Often chemists find crystal structures too complicated – they want single molecules (“moieties”). Nick Day did that in Crystaleye and we’ve transferred the software to COD. And every new addition to the BO repertoire increases its value n-squared. 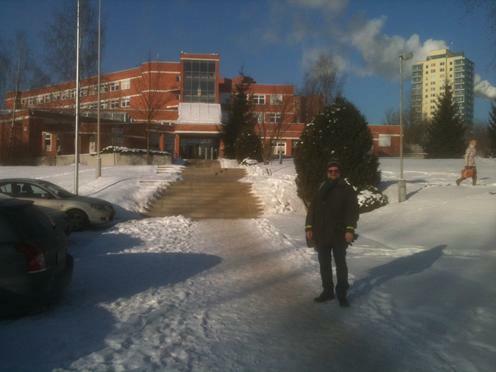 Thank you Saulius – your obelisk will be in the post.